The Samsung ML-3470 printer is a network-ready workgroup printer. It is easy to use, install and has a great speed. With a maximum resolution of 1200 x 1200 dpi, it provides professional looking text documents and grayscale images. The Samsung ML-3470 toner cartridges have a monthly duty cycle of 80,000 sheets but the only problem with them is their low input capacity. They are equipped with 64MB memory that can be further expanded to 320MB. This monochrome laser printer weighs 11.1 kg and measures 400 x 433.4 x 285 mm. Ethernet, USB, and parallel interfaces are several connectivity options by which users can connect to this printer. The Samsung ML-3470 printer has a 250-sheet input tray at the bottom and a control panel with monochrome display on top. Its toner save mode helps to reduce running costs. Print speed is quite fast at 33 ppm for A4 sized papers and 35 ppm for letter sized papers. The problem is that it has a low paper input capacity and no optional paper trays are available. The Samsung ML-3470 toner cartridges are black in colour as it is a monochrome printer. Toner save mode and high page yield of 10,000 pages helps to reduce running costs. It produces professional looking text documents and grayscale images. It is easy to use and install and is a good printer to use. It has duplexer for automatic double-sided printing and gives professional quality output. The only problem is its low paper input capacity and that it does not offer optional paper trays. Overall, it is a good printer to use. Q. Are colour toner cartridges also available for Samsung ML-3470 printers? A. No, Samsung ML-3470 printers are monochrome printers. This means that they only support black and white printing and not colour printing. Hence, you cannot get coloured toner cartridges for this printer. Q. 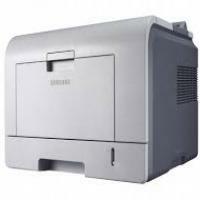 Where can a Samsung ML-3470 printer ideally be used? A. The Samsung ML-3470 is a heavy duty printer with fast printing speed and multiple connectivity options by which users can connect several devices to this printer to print from. This makes the ML-3740 printer suitable for small or big offices that require a lot of printouts. Q. What is the difference between original Samsung ML-3470 toner cartridges and the compatible toner cartridges? A. The difference between original toner cartridges and compatible toner cartridges is that, original ones are made by the printer manufacturing company, whereas compatible toner cartridges are manufactured by a third party company to work with your printer. Also, the compatible Samsung ML-3470 toner cartridges are cheaper and have a higher page yield as compared to the original toner cartridges. Q. How long would it take for this printer to produce 60 copies of a document? A. Samsung ML-3470 printers come with a print speed of about 33 pages per minute which is quiet fast as compared to other printers in this range. It would take you about 2 minutes to print 60 copies of a document with this printer. Q. How do I check the remaining level of toner left in the cartridge? Press "Menu" until System Setup appears on the bottom line of the display and press OK.
Press the scroll buttons to select “Maintenance” and press OK.
Use the scroll buttons until “Supplies Life” appears and press OK.
Use the scroll buttons to access “Toner Remains” and press OK. The display shows the percentage of the remaining toner. Q. I have placed an order for the compatible range of cartridges from this site in bulk and now I am worried that I won’t be able to finish them before their expiry date. Can you please suggest me what should I do now? A. If you have already made a purchase of the Samsung ML-3470 toner cartridges, nothing to worry for, Store the cartridges in a cool and dry place safely to maximize its ink life and use them before they dried up. Q. I got the message ‘Toner Low Replace Toner’. What can be done to clear this message? Now you will observe that the Toner Low Replace Toner message does not appear on the screen but, the Replace Toner message will remain there for reminding you that the new Samsung ML-3470 toner cartridge needs to be installed for getting good quality. Caution: Once you have chosen On, this setting will be permanently written to the memory of the Samsung ML-3470 toner cartridge, and the menu will be disappeared from the Maintenance menu. Q. Can I use Samsung ML-3470 to print professional quality printouts? A. Yes, one can get professional looking text documents and grayscale images from this printer. It has a duplexer for automatic double-sided printing and thus used by professional users for giving quality outputs. Q. What type of damage a compatible Samsung ML-3470 toner cartridge can do to my printer? A. The Compatible toner cartridges supplied on this site, have the same specifications as one gets from the originals. A small possibility may exist for any toner cartridge to leak toner into the printer causing unwanted stray marks on the paper. Cleaning the printer on regular basis and replacing the toner cartridge will easily correct this. It is unlikely that a toner cartridge will damage the printer itself.